TT Club, International insurance provider to the freight transport and cargo handling industries, has been an enthusiastic supporter of the Seahorse Club Journalist Awards for some years. The Awards are specifically for media professionals active in the maritime, air cargo and logistics arena. At the 2017 Awards Presentation this week TT Club again sponsored the category that encourages and celebrates new blood in the press ranks of freight transport. The Newcomer of the Year was announced as Sophie Barnes of Heavy Lift and Project Forwarding International. Editors of international media outlets in the sector were asked to nominate journalists with no more than two year’s experience, and who show outstanding potential of the salient issues facing the modern freight transport industry. Furthermore, the editors were urged to identify candidates producing consistently high quality content, providing an informative read and a balanced view on the subject at hand. This year the calibre of nominee’s writing was of an extremely high quality. The judges commented, “The scoring between those on the short-list was close, Sophie really shone through as a clear winner. Her article encompassed a very rounded discussion of a complex topic, presented with great understanding and in a mature writing style”. 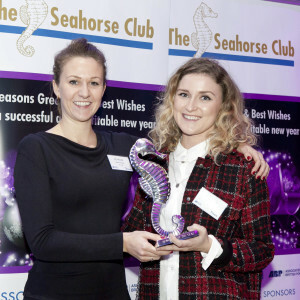 Both TT Club and Seahorse encourage editors to nominate members of their staff to enter the 2018 Awards next year, especially in this Newcomer category. The nominees are voted for by their journalist peers and judged by an experienced group of industry professionals, it is a unique accolade for young aspiring freight journalists.